When your arms cry out for liberty, muscle tanks are the only answer. We noticed the trend of the ever-evolving Sleeveless T-shirt make a serious comeback in around 2011, and it’s seemingly not going anywhere any time soon. So, is it a tank? Is it a tee? Who cares. As we bridge the gap between fashion, function and fitness, the muscle tank/tee hits the sweet spot of comfortable casual wear for men and women alike. Let us save you some time digging around online for wholesale muscle tanks, and check out why we’ve selected these as our TOP PICKS. Unless you’ve been hiding under a rock, you’d most likely be familiar with the undisputed King of all Muscle Tees – The AS Colour Barnard. As with many of their styles, the AS Colour Barnard Tank Tee has been absolutely dominating the market since it first hit the streets. If you have a look around on a sunny day anywhere across Australia, a large percentage of the people you see trying to work off their t-shirt tan would be wearing this exact garment. Its deep, raw cut edges, loose fit, and long length have set the tone for the new wave of modern muscle tee styling. Nowadays, due to its huge popularity, you can enjoy the AS Colour Barnard in 7 colours from their standard cotton range. They’ve also introduced some spin-off styles like the uber premium Stone Wash range – available in 5 awesome and unique earthy tones. Then there’s the more street-label suited Tall Barnard – available in 3 core colours for all your homies. Initially created as a mens style, the smallest sizes XS and S were quickly noticed to be a strong seller. That’s cause the ladies also absolutely love the Barnard, especially in the fitness world. One thing we found was that many of the more petite ladies found the XS Barnard to be a little too long. So what did AS Colour do? They listened! If you’re wanting something with more of a ladies cut, smaller, shorter overall and not too deep down the sides, check out the new ladies muscle tee equivalent – The Brooklyn Tank. INSIDER INFO – Get your little tikes into some muscle tanks too – as the AS Colour Youth Barnard Tank is now available. Click here to get in touch. When it’s time for Sun’s Out, Guns Out, sometimes 100% cotton is just not gonna cut it. Introducing, without further ado, the TRI-BLEND Muscle Tank from our friends across the Pacific – American Apparel! Tri-Blend is a mix of cotton, polyester and rayon. This combination gives you a super soft, ultra comfortable balance that’s breathable and can really take a thrashing in the wash! American Apparel have arguably the best Tri-Blend fabric on the market, and now with their new arrival Muscle Tee, so many biceps in the world of fitness will be absolutely stoked. One element which we absolutely LOVE with this new style, is that it has a proper hemmed edge in the arm holes, rather than a raw cut. Available in Tri-Black and Athletic Grey from XS – XL (mens sizing). INSIDER INFO – You may already be aware that American Apparel was recently acquired by another brand, and some of their apparel manufacturing was relocated outside the US. If you want American Apparel MADE in USA, they are still making some core styles in the US, and we’re the only printers in Australia who can supply them direct to you at wholesale rates. Because, well, we’ve got the hook ups. Just give us a call on 1300 853 474, or click here to find out more. One quick glance at the Bella + Canvas catalogue or story video, and it’s clear that this brand is quite simply, on another level. The Bella + Canvas range is taking comfort and style to new heights, particularly with their attention to detail on cutting edge styles that are totally modern and unique. The collection focuses on soft, flowy, lightweight fabrics that are just a pleasure to wear. They haven’t left ladies wear behind either, with heaps of fashion forward options to choose from. INSIDER INFO – You’ll be hard pressed to find anyone in Australia who have the industry know-how to bring in Bella + Canvas from overseas, but we’re able to import from USA and deliver direct to your door! Give us a call on 1300 853 474, or just click here to find out more. As a wholesale blanks brand, RAMO have seriously stepped up their game in recent years! Particularly with the introduction of their Greatness Heather – which is a collection of styles available in their poly/cotton fabric blend. One thing which all the other suppliers lack in their Muscle Tank range, is a nice bright colour selection. They have a lovely array of bright colours available in their Muscle Tees, which come in both a ladies and a mens cut. Also in their range is their 100% cotton muscle tank, which also comes in mens and ladies. The RAMO Sleeveless Tee range is somewhere between a deep cut and a traditional t-shirt with no sleeves shape. If you’re not a fan of the raw cut edges, this is a great solution as it has an overlocked edge down the arm holes. PLUS – Don’t look past the awesome RAMO Sleeveless Hood that these guys have available in mens, ladies, zip and pullover style…they offer a great colour range too! INSIDER INFO – Just note that the RAMO Greatness Heather BLACK fabric is a little temperamental with printing so we need to allow an additional base screen to get best results. This does also mean a heavier print, so we’d recommend a light coloured garment with a dark coloured print. 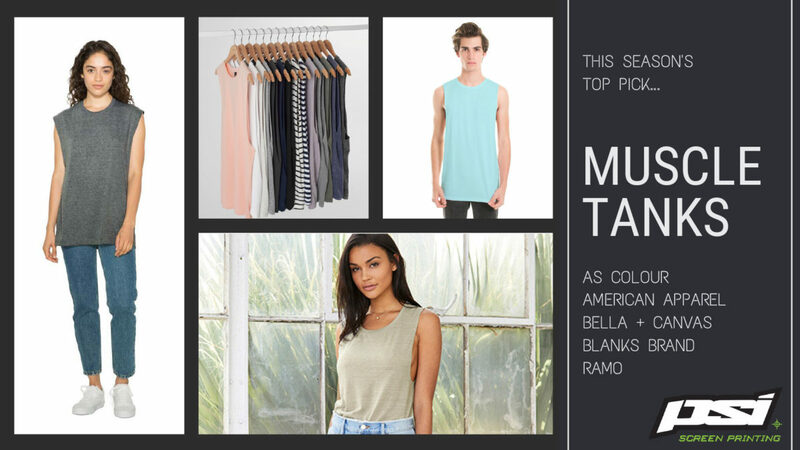 While the world of wholesale blank apparel brands have a selection of deep cut muscle tanks to choose from, Blanks Brand says…. If the usual deep cut just ain’t deep enough, don’t look past this little bad boy from Blanks Brand. Don’t be fooled by it’s humble name, the Blanks Brand Basic Tank is built for the cool kids, extra loose, extra long, extra deep. All of the styles in their range are made for retail fashion in a really soft, lightweight cotton that just screams street wear. INSIDER INFO – Blanks Brand garments are especially perfect for boutique labels, as many of their styles do not have any tagging on them, so it makes your custom relabelling more cost effective! Phew….that’s a lot of Sleeveless Tees! Are you a fan of the muscle-friendly style? If you’re looking at introducing Muscle Tanks to your range for the first time, you can always play it safe by running them as a risk free Pre-Order rather than projecting sizes. We’re here to help, and chances are we can save you a heap of time in research just by having a quick chat over the phone. Get in touch to find out more on 1300 853 474 or you can email us here. Stay tuned for more style highlights to come!